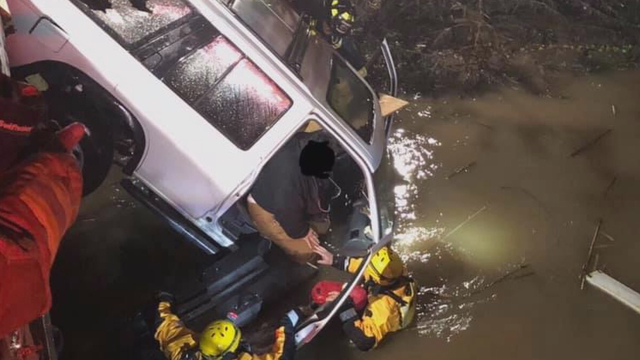 SANTA ROSA (KRON) - Santa Rosa firefighters rescued a woman and dog trapped inside a car Friday night after the vehicle went into a canal. According to the Santa Rosa Fire Department, it happened around 9:15 p.m. in the 3200 block of Guerneville Road. Authorities say the vehicle had driven off a bridge located on private property into a tributary of the Laguna de Santa Rosa. The vehicle had fallen 10-feet and when emergency crews arrived it was in a near verticle position. The woman and her dog were still inside of the partially submerged passenger compartment. Crews used chains and cable to stabilize and secure the rear of the car to the bridge. Firefighters removed the dog first at the request of the woman. The puppy was not injured and was passed along to a friend at the scene. Water rescue technicians entered the flowing, chest deep water to remove the woman from the car. She was placed on a Carlson Board, similar to a "boogie board", and floated across the creek to an awaiting ladder. The woman was then able to climb the ladder with assistance from firefighters out of the waterway. She was transported to Memorial Hospital with what appeared to be non-life-threatening injuries.